Update: You can now buy vadouvan at places like Amazon and The Spice House (where they are actually using my Red Lentil Soup recipe without permission, ahem.) It will probably be stronger than my homemade version, so if you use packaged vadouvan, start off with a third of the amounts listed in the recipes below and add more to taste. You may not have heard of vadouvan, but I’m predicting it will be the next trendy ingredient. It’s been popping up on restaurant menus a lot lately and caused a bit of web chatter when Ruth Reichl, editor of Gourmet, mentioned trying it a few months ago, but now that Gourmet has published a recipe for it in this month’s issue–as well as on its site–I’m sure that soon everyone will be making this formerly hard to procure seasoning. So what is it, and is there any reason other than trendiness to try it? 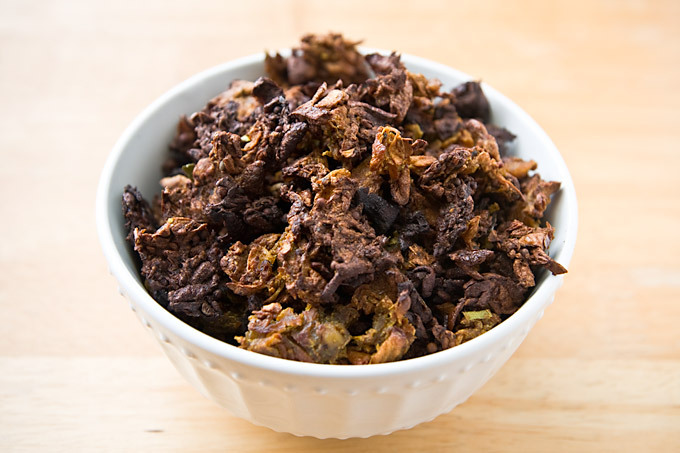 The short answers are 1) a Frenchified version of a south Indian seasoning and 2) Yes. Since, as you know, I’m crazy for anything smoky or cuminy, I just had to try this recipe. It took a while, and it required me to heat up my oven and to hover nearby for frequent stirrings. And once I made it, my kitchen smelled like onion and curry for days, though perhaps turning on a vent fan would have helped, something I realized after the fact. 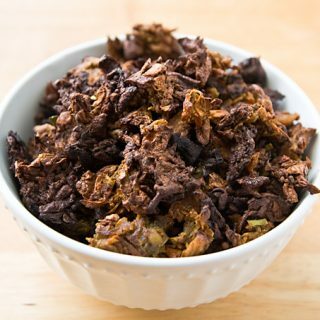 But now that I’ve got it made and safely stashed in my freezer, I’m thrilled that I’ll be able to add this savory, oniony, lightly-curry-scented flavor to anything quickly and easily with just a couple of tablespoonfuls. Of course I adapted the recipe. The original made twice as much, and I was unwilling to commit so many pounds of shallots and onions to an untried recipe. It also called for frying in oil, though not a huge amount considering how much it makes, but I wanted to be able to add the seasoning freely without worrying about how much added fat it contained, so I reduced the oil to just a few quick sprays to keep it from sticking or burning. I altered the ingredient amounts just a little, adding a touch more cumin and mustard seed just because I like them. And finally, I used fresh hot chile peppers because I’ve got more of them than I can use in my garden. Remove the stems from the peppers, place them in a food processor with the garlic, and process until minced. Add half of the onions and pulse to chop coarsely. Remove from the processor and repeat with remaining onions and shallots until all are coarsely chopped. Spray a large skillet with canola oil and heat on medium-high. Add the chopped vegetables. (Turn your face away as you do this because the fumes will cause you to tear up!) 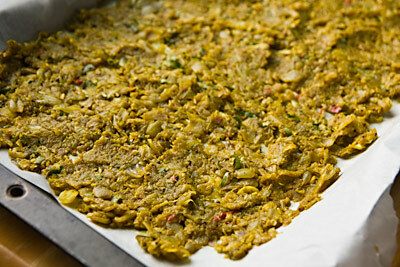 Reduce heat to medium and cook, stirring often and scraping the bottom, until onions begin to brown, about 15-20 minutes. Add all remaining ingredients and stir well. Spray the top of the mixture lightly with canola oil. Bake until browned and most moisture is gone, 1 to 1 1/4 hours, stirring regularly to break up the onions as best you can. Be careful not to burn! Cool, break up any large clumps, and store in the refrigerator up to one month or the freezer up to six months. I didn’t want to give you this long-cooking recipe without also showing you a couple of ways to use it. For my first use of vadouvan, I went with something simple, something that adapts easily to different seasonings, something using Indian ingredients, and something my family always likes: red lentil soup. 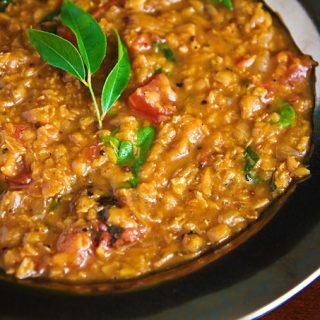 Cooking the lentils with vadouvan gave them an indescribably smoky, sensual flavor. The curry flavor is there, in the background, but the pungency of the roasted onions and shallots wins out. It was a taste that my whole family loved. Heat a large saucepan over high heat. When hot, add the cumin and mustard seed; cook for 1 minute or until seeds begin to pop. Immediately add the onion and saute for 3 minutes. Add the lentils, water, vadouvan, garlic, and coriander. Bring to a boil, reduce heat, and cook, covered, until lentils are completely soft, about 20 minutes. Add the tomatoes and salt to taste. Simmer, uncovered, adding more water if necessary, for about 20 minutes. Just before serving, stir in the spinach and cook just until wilted but still bright green. The vadouvan-cashew cream sauce in the recipe below may be the single greatest reason you should take the time to whip up a batch of vadouvan. I made this for lunch today, eating two of the four servings, and I could easily go back and eat the whole batch. The sauce makes the recipe and would be wonderful on tofu, tempeh, seitan, baked potatoes–anywhere you want a rich, oniony, almost meaty taste. Someday soon I’m going to be simmering chunks of tofu and sliced mushrooms in this sauce and serving it over rice. I used small white eggplants from my garden, but any kind of small eggplant will do. 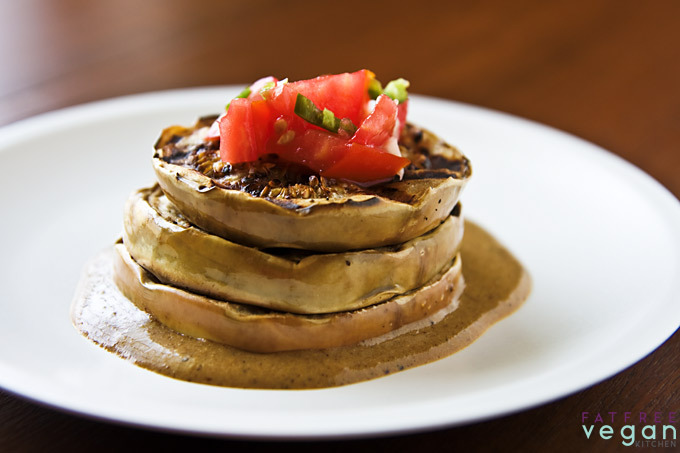 While the eggplants are cooking, make the sauce by blending the soymilk, nutritional yeast, cashews, and vadouvan in a small blender. Pour into a saucepan, add salt to taste, and bring to a boil. Turn down to very low and keep warm until eggplants are ready. Chop the tomato and add the garlic, chile pepper, and vinegar. Add salt and black pepper to taste. 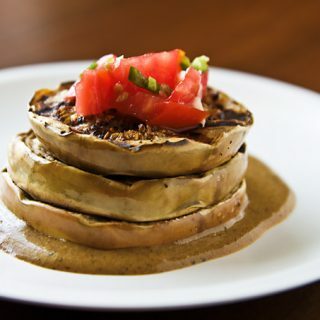 Assemble on appetizer plates by layering a spoonful of sauce followed by three slices of eggplant with a little sauce between each slice. Top with the tomato mixture and enjoy. I would love to get the name of a store I can order this from. Thanks. Those are really good recipes! Hey I actually made this and it tastes great. I had a buuunch of Hinkelhatz peppers (very hot) and onions in my CSA box this week. Id rather make something than buy it in a jar. Plus it lasts so long in the fridge! I love the eggplant dish. It looks very haute cuisine. I am so making that someday soon! Hi. Just noticing in your nutritional info that this recipe for vadouvan has 84 grams of carbohydrates. How is that possible? Where are they coming from? 84 grams is the equivalent of about four or five slices of bread or six to eight corn tortillas! So how do you figure there’s 84 grams of carbohydrates in a recipe made up of a few tablespoons of ground spices and onions? Thanks. 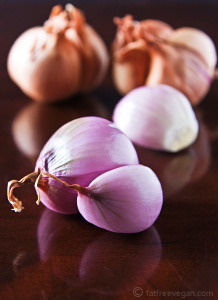 There’s 41.6g carbohydrate in a pound of onions and 37.6 in a half pound of shallots. That’s 79.2g. The rest comes from the peppers and spices. 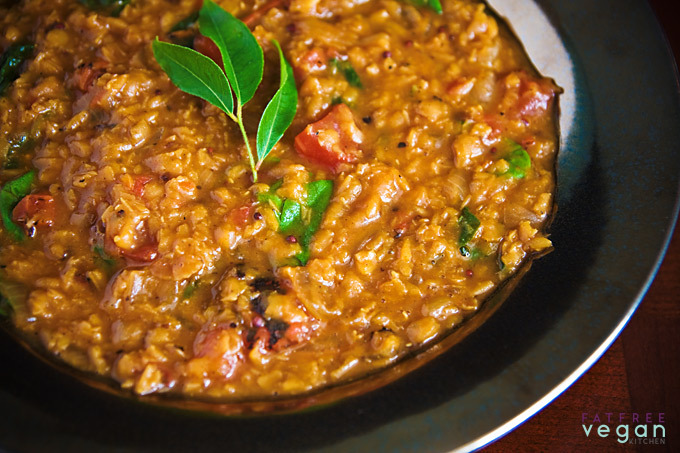 In the red-lentil Vadouvan Curry soup recipe: is the coriander ground or whole?